Spinal surgery is a relatively common medical procedure with approximately 1.2 million operations occurring annually in the U.S.1 Imaging plays a critical role in routine surveillance and assessment of new and recurrent symptoms after spinal surgery. Consequently, the postoperative spine is commonly encountered in specialized and general radiology practices. Interpretation of postoperative imaging is complex given the patient’s underlying preoperative spinal pathology, the altered postsurgical anatomy, and the artifact caused by hardware. 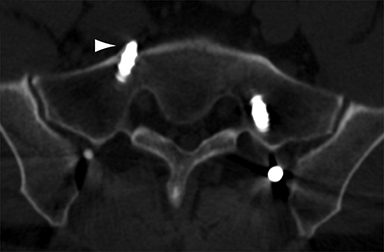 In this review, we focus on common, clinically challenging scenarios in the interpretation of postoperative spinal imaging, including evaluating hardware complications, assessing for segmental fusion, detecting spinal infection, differentiating paraspinal fluid collections, and separating recurrent disc disease from peridural fibrosis. Hardware complication or acceptable postsurgical appearance? Evaluation of spinal hardware integrity is the most common indication for postoperative surveillance imaging. 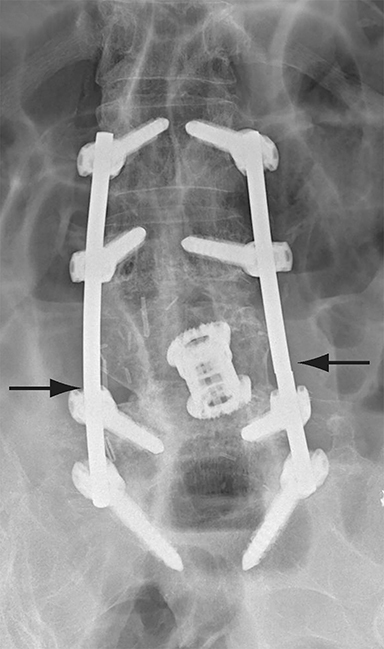 Hardware-related complications, including implant fracture, loosening, migration and subsidence, are relatively common, estimated to occur in 2 to 40% of spinal fusion patients.2 Persistent motion, pseudoarthrosis, and infection are common predisposing factors to hardware failure. While the diagnosis is relatively straightforward when there is frank hardware failure, subtler alterations can pose a dilemma as to whether findings are within the range of acceptable postoperative appearances. Frank hardware fracture, usually involving fracture of screws or posterior rods, is relatively rare. 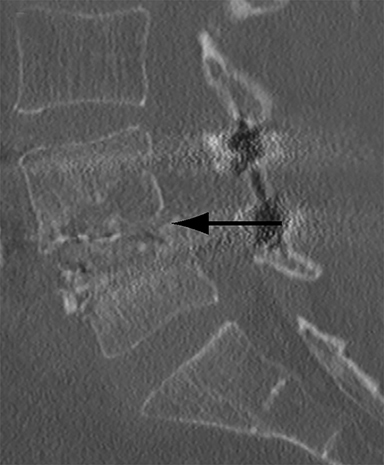 Pedicle screw fracture is estimated to occur in 0.5% of cases.6 Iliac screw fracture is more common, occurring in 8-22% of cases, and usually signifies failure of fusion at the lumbosacral junction.7 Rod fracture is seen in 9-16% of postoperative cases of major adult spinal deformity.8 Screw loosening is suspected when a radiolucent rim is ≥2 mm in width or progressively enlarges over time. In the late postoperative period, hardware migration can result from bone remodeling, chronic hardware-related pressure erosions or failure of segmental fusion. 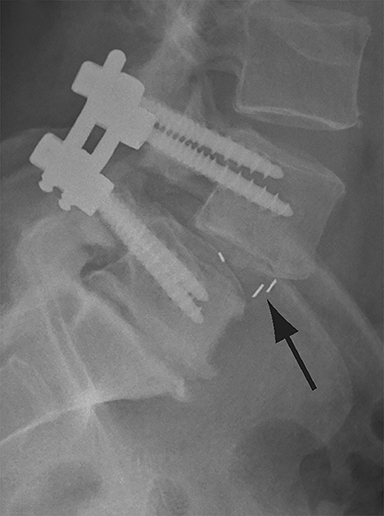 Screws initially well-positioned may end up protruding through the endplate into the disc, or through the pedicle or vertebral body resulting in direct damage to nearby neurovascular structures or development of pressure-related bursae that may impinge adjacent nerves or vessels. 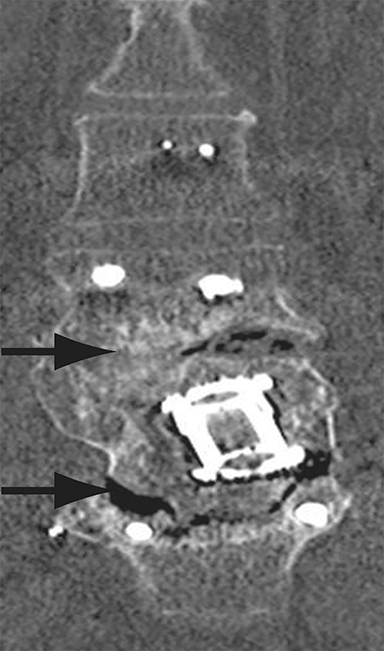 Complications related to interbody cage disc spacer placement involve cage migration, displacement, subsidence, and endplate fracture (Figure 1). Interbody disc cage spacers should lie anterior to the posterior vertebral body margin by at least 1/4 of the endplate length to minimize the potential for spinal canal narrowing and thecal sac impingement. 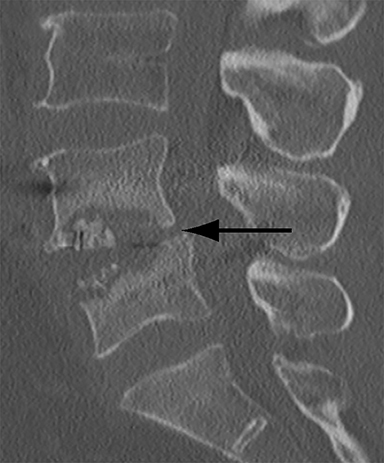 Subsidence is defined as more than 3 mm of migration of the interbody disc spacer into the vertebral endplate, resulting in loss of disc space height.9 Morselized bone autograft will not be visible on plain radiographs; thus, the appearance of an interbody implant floating in the disc space does not necessarily indicate bone-graft failure in the early postoperative period. Failed fusion or too early to see radiographic fusion? Assessing the extent of fusion, or lack thereof, is a common imaging indication in the late postoperative period. Greater than 3 of motion between flexion and extension views obtained 8-16 weeks after surgery is suggestive of failed fusion.9 Radiographically, osseous fusion is defined by the development of bridging trabecular bone. The ‘time to fusion’ varies with age and with anatomical site and morphometric location. In adults, posterolateral or facet fusions take longer than interbody fusions (9-12 months versus 3-9 months) with fusions in the cervical spine occurring faster than thoracic or lumbar spine.13 Premineralized osteoid may allow a functional fusion, but is radiolucent; thus, functional fusion on flexion-extension views may precede osseous fusion by several months. The clinical diagnosis of surgical site infection (SSI) can often be challenging. There may or may not be wound discharge, although this is more typical in SSI after instrumentation. Surgical site infection typically presents between postoperative days 4 and 28. Temperature is unreliable as pyrexia is often seen with post-anesthetic metabolic derangement, atelectasis or any remote nonsurgical site infection. Rising CRP beyond 96 hours is characteristic.18 The diagnosis is usually made using a combination of clinical, laboratory and radiographic features. Abscess or sterile postoperative fluid collection? Differentiating abscess from non-infected postoperative hematoma, seroma or pseudomeningocele has significant clinical implications. With progression of infection, heterogeneously enhancing T1 low signal and T2 high signal paraspinal soft tissue organizes into a peripherally enhancing T1 low/intermediate signal and T2 high signal fluid collection (Figure 5). 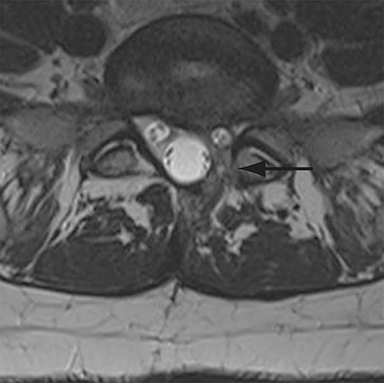 Adjacent features of spondylodiscitis (as described in the preceding section) are usually present as most epidural abscesses result from direct extension of spondylodiscitis. 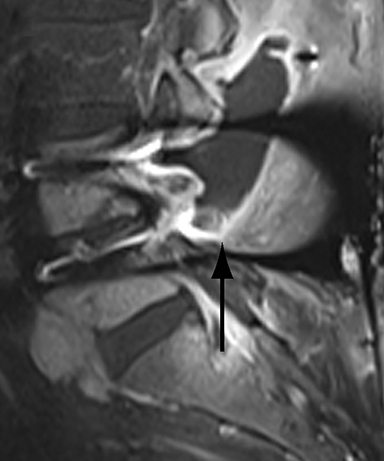 Similarly, a psoas or paraspinal abscess can develop as a complication of spondylodiscitis. Confident identification of superimposed infection in a postoperative hematoma or seroma can be challenging at times. Thin peripheral contrast enhancement may be a normal finding in non-infected hematomas and seromas, but irregularly enhancing walls or adjacent inflammatory change strongly points to infection.1 Diffusion weighted imaging can help to identify infected paraspinal collections with developing abscesses demonstrating restricted diffusion.38 However, it should be noted that chronic hematomas may also demonstrate restricted diffusion due to viscous blood breakdown products.38 Unrepaired postsurgical dural leaks resulting in pseudomeningocele formation are relatively uncommon, occurring in less than 2% of all spinal surgery cases.12 Large pseudomeningoceles that extend to the skin surface are at particularly high risk for infection and cutaneous fistula formation. 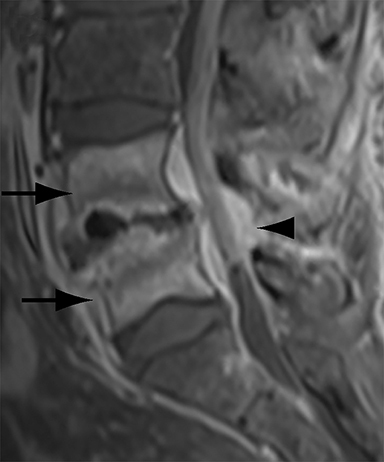 The key finding on MRI to distinguish pseudomeningoceles from other extra-dural fluid collections is the identification of either direct communication or flow artifact between the thecal sac and the collection (Figure 5). Thin peripheral contrast enhancement can be a normal finding, but irregular enhancement, especially with adjacent inflammatory change, is highly suspicious for infection. Ancillary findings of meningitis including leptomeningeal enhancement and intracranial increased T2 FLAIR signal in the sulci may be present with an infected pseudomeningocele. Importantly, pachymeningeal enhancement due to intracranial hypotension should not be confused with leptomeningeal enhancement indicative of meningitis. Recurrent disc herniation or peridural fibrosis? Postoperative spinal imaging is a common and potentially challenging radiological examination to accurately interpret. Postsurgical changes in the spine can simulate significant postoperative pathology. 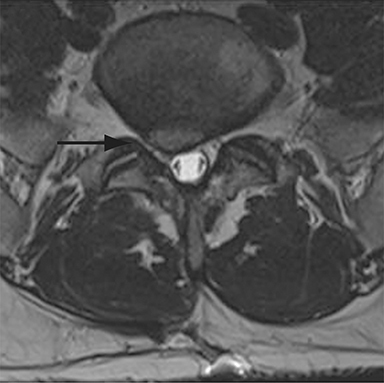 Several key imaging features are helpful to accurately assess hardware integrity, segmental fusion, infection, paraspinal fluid collections, and recurrent disc disease. 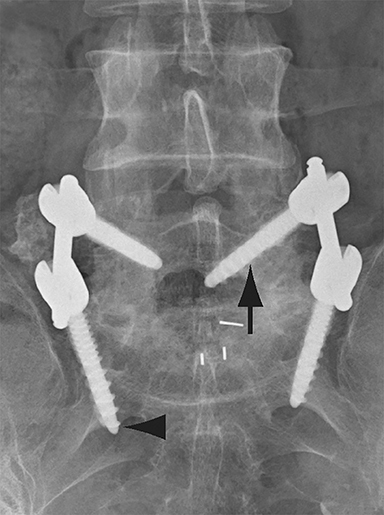 Malpositioned pedicle screws that violate the inferomedial cortices of the pedicle or protrude through the anterior cortex of the vertebral body are the most common hardware complication. Endplate osteolysis and interbody spacer subsidence are expected in rhBMP assisted fusion. When assessing fusion on CT, bridging trabeculae may not be present before 6 months, but must be present by 24 months if fusion has successfully occurred. 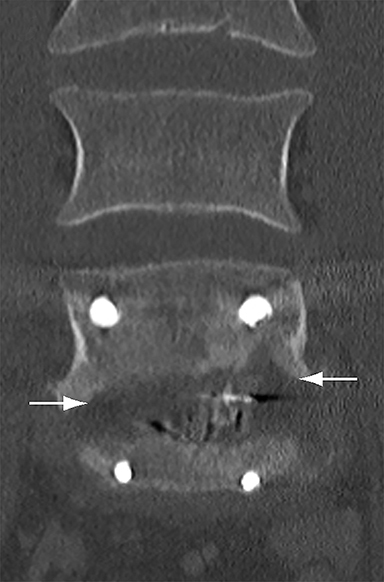 Endplate osteolysis with progressive or persistent enhancement beyond 6 weeks is consistent with spondylodiscitis. 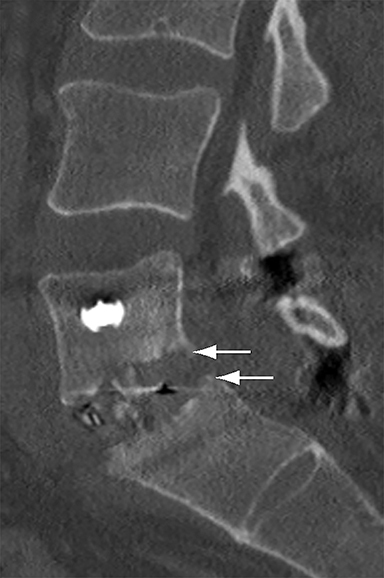 Thin wall enhancement may be present in sterile paraspinal fluid collections, but thick enhancing walls and restricted diffusion, especially when associated with features of spondylodiscitis, are concerning for abscess. Recurrent disc herniation enhances only peripherally on images obtained within 5 minutes of gadolinium administration, while peridural fibrosis enhances diffusely. These key imaging features can help the radiologist to accurately navigate these challenging scenarios in postoperative spinal imaging and confidently distinguish postoperative changes from true pathology. Jain NK, Dao K, Ortiz AO. 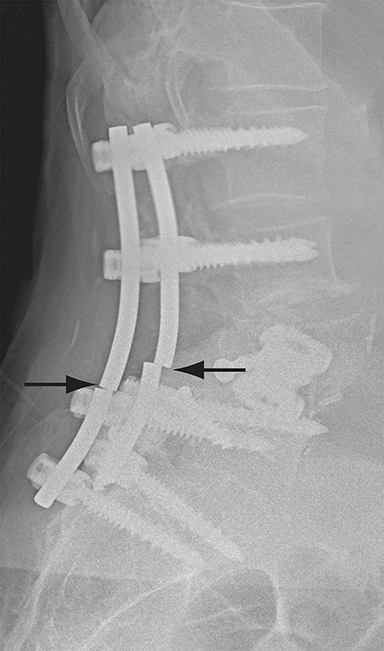 Radiologic evaluation and management of postoperative spine paraspinal fluid collections. Neuroimaging Clin N Am. 2014;24(2):375-389. Nasser R, Yadla S, Maltenfort MG, et al. Complications in spine surgery. J Neurosurg Spine. 2010;13(2):144-157. Venu V, Vertinsky AT, Malfair D, et al. Plain radiograph assessment of spinal hardware. Semin Musculoskelet Radiol. 2011;15(2):151-162. Yeo JM, Vertinsky AT, Chew JB, et al. Imaging in adult scoliosis: preoperative assessment and postoperative complications. Semin Musculoskelet Radiol. 2011;15(2):143-150. Young PM, Berquist TH, Bancroft LW, et al. Complications of spinal instrumentation. Radiographics. 2007;27(3):775–789. Lonstein JE, Denis F, Perra JH, et al. 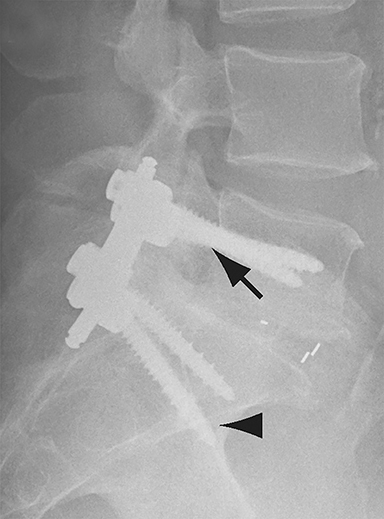 Complications associated with pedicle screws. J Bone Joint Surg (Am Vol). 1999;81(11):1519–1528. Guler UO, Cetin E, Yaman O, et al. 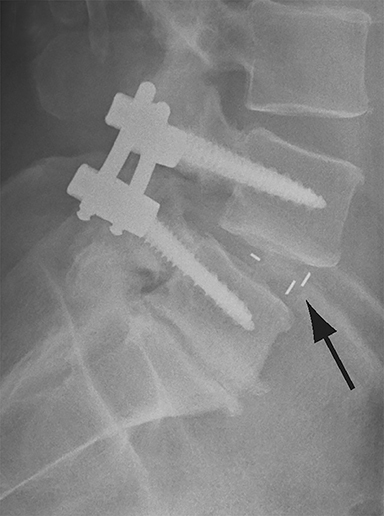 Sacropelvic fixation in adult spinal deformity (ASD), a very high rate of mechanical failure. Eur Spine J. 2015;24(5):1085-1091. Barton C, Noshchenko A, Patel V, et al. 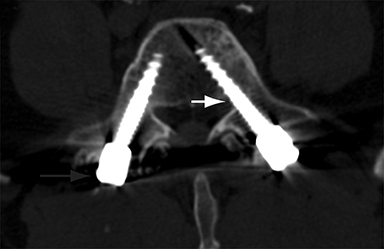 Risk factors for rod fracture after posterior correction of adult spinal deformity with osteotomy: a retrospective case-series. Scoliosis.2015;10:30. Malhotra A, Kalra VB, Wu X, et al. 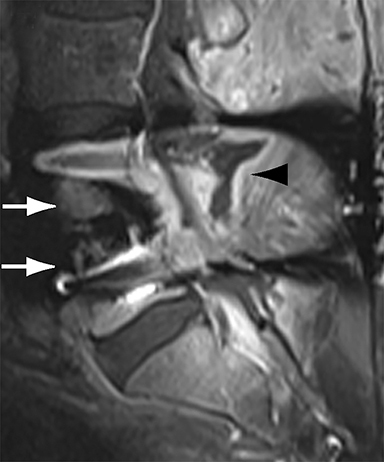 Imaging of lumbar spinal surgery complications. Insights Imaging. 2015;6(6):579-590. Sethi A, Craig J, Bartol S, et al. Radiographic and CT evaluation of recombinant human bone morphogenetic protein-2-assisted spinal interbody fusion. AJR Am J Roentgenol. 2011;197(1):W128-W133. Saigal G, Quencer R, Guest JD, et al. Vertebral body osteolysis following the use of bone morphogenetic protein in spinal surgery: a mimicker of infection. J Neuroradiol. 2012;39(5):354-359. Willson MC, Ross J. Postoperative spine complications. Neuroimaging Clin N Am. 2014;24(2):305–326. Slone RM, MacMillan M, Montgomery WJ. Spinal fixation. Part 3. Complications of spinal instrumentation. Radiographics.1993;13(4):797–816. 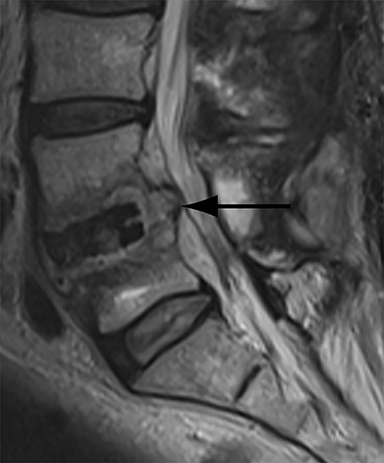 Zampolin R, Erdfarb A, Miller T. Imaging of lumbar spine fusion. Neuroimaging Clin N Am. 2014;24(2):269-286. Togawa D, Bauer TW, Lieberman IH, et al. Histologic evaluation of human vertebral bodies after vertebral augmentation with polymethyl methacrylate. Spine. 2003;28(14):1521–1527. arreon LY, Glassman SD, Schwender JD, et al. Reliability and accuracy of fine-cut computed tomography scans to determine the status of anterior interbody fusions with metallic cages. Spine J. 2008;8(6):998–1002. Katayama Y, Matsuyama Y, Yoshihara H, et al. Clinical and radiographic outcomes of posterolateral lumbar spine fusion in humans using recombinant human bone morphogenetic protein-2: an average five year follow-up study. Int Orthop. 2008;33(4):1061–1067. Kasliwal MK, Tan LA, Traynelis VC. Infection with spinal instrumentation: Review of pathogenesis, diagnosis, prevention, and management. Surg Neurol Int. 2013;4(Suppl 5):S392-S403. Hegde V, Meredith DS, Kepler CK, et al. Management of postoperative spinal infections. World J Orthop. 2012;3(11):182–189. Go JL, Rothman S, Prosper A, et al. Spine infections. Neuroimaging Clin N Am. 2012; 22(4):755–772. Lazennec JY, Fourniols E, Lenoir T, et al. Infections in the operated spine: update on risk management and therapeutic strategies. Orthop Traumatol Surg Res. 2011;97(6):S107–S116. Hayashi D, Roemer FW, Mian A, et al. 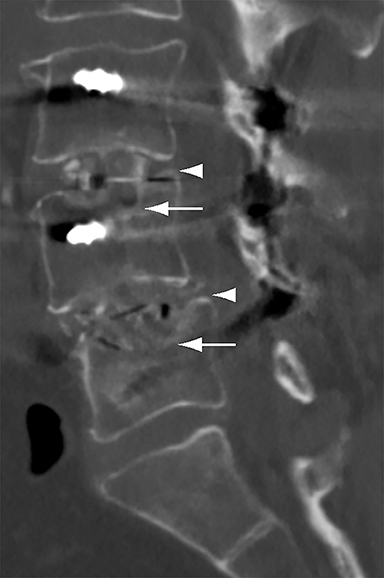 Imaging features of postoperative complications after spinal surgery and instrumentation. AJR Am J Roentgenol. 2012;199(1):W123-W129. Hong SH, Choi JY, Lee JW, et al. 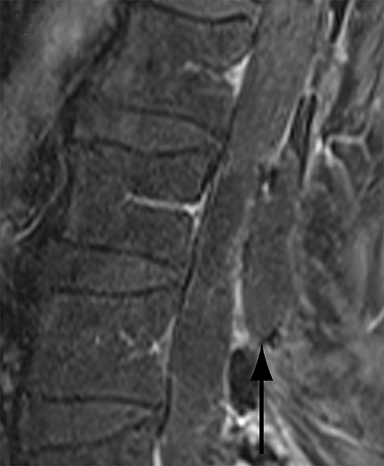 MR imaging assessment of the spine: infection or an imitation? Radiographics. 2009;29(2):599-612. Gouliouris T, Aliyu SH, Brown NM. 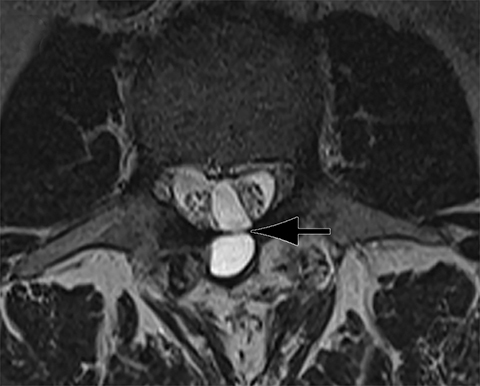 Spondylodiscitis: update on diagnosis and management. J Antimicrob Chemother. 2010;65(3):iii11–24. Bommireddy R, Kamat A, Smith ET, et al. 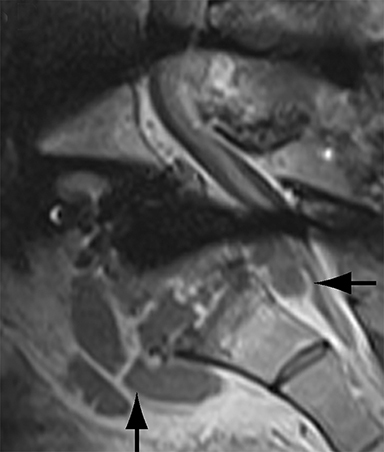 Magnetic resonance image findings in the early postoperative period after anterior cervical discectomy. Eur Spine J. 2007;16(1):27–31. Thakkar RS, Malloy JP, Thakkar SC, et al. Imaging the postoperative spine. Radiol Clin North Am. 2012;50(4):731–747. 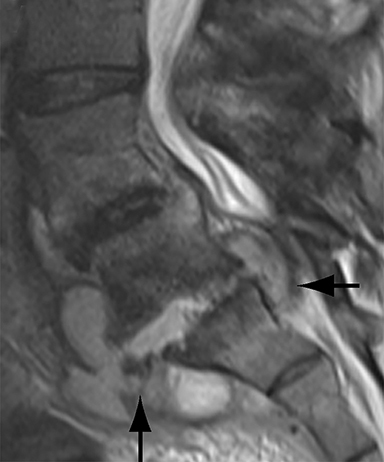 Van Goethem JW, Parizel PM, Jinkins JR. Review article: MRI of the postoperative lumbar spine. Neuroradiology.2002;44:723–739. Van Goethem JW, Van de Kelft E, Biltjes IGGM, et al. MRI after successful lumbar discectomy. Neuroradiology. 1996;38(1):S90-S96. Tali ET. Spinal infections. Eur J Radiol. 2004;50(2):120-133. Ledermann HP, Schweitzer ME, Morrison WB, et al. 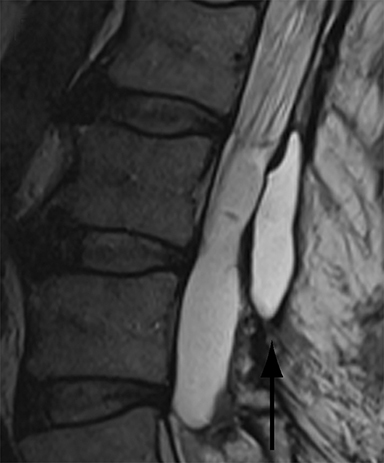 MR imaging findings in spinal infections: rules or myths? Radiology. 2003;228(2):506–514. Eguchi Y, Ohtori S, Yamashita M, et al. 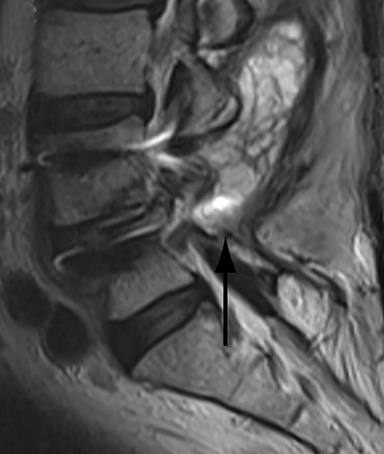 Diffusion magnetic resonance imaging to differentiate degenerative from infectious endplate abnormalities in the lumbar spine. Spine. 2011;36(3): E198–E202. De Maeseneer M, Lenchik L, Everaert H, et al. Evaluation of lower back pain with bone scintigraphy and SPECT. Radiographics. 1999;19(4):901-912. Love C, Patel M, Lonner BS, et al. Diagnosing spinal osteomyelitis: a comparison of bone and Ga-67 scintigraphy and magnetic resonance imaging. Clin Nucl Med. 2000;25:963-977. Lin WY, Tsai SC, Chao TH, et al. Uptake of gallium-67 citrate in clean surgical incisions after colorectal surgery. Eur J Nucl Med. 2001;28(3):369-372. Palestro CJ, Kim CK, Swyer AJ, et al. 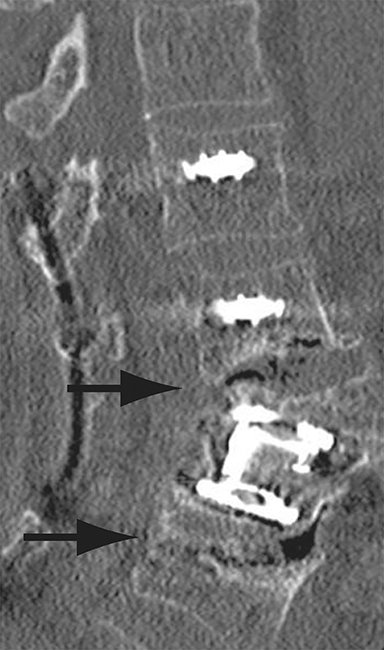 Radionuclide diagnosis of vertebral osteomyelitis: indium-111-leukocyte and technetium-99m-methylene diphosphonate bone scintigraphy. J Nucl Med. 1991;32(10):1861-1865. Skanjeti A, Penna D, Douroukas A, et al. PET in the clinical work-up of patients with spondylodiscitis: a new tool for the clinician? Q J Nucl Med Mol Imaging. 2012;56(6):569-576. Fuster D, Tomás X, Mayoral M, et al. 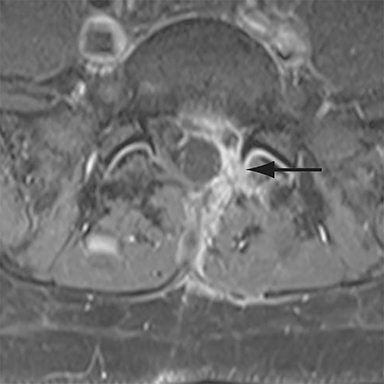 Prospective comparison of whole-body (18)F-FDG PET/CT and MRI of the spine in the diagnosis of haematogenous spondylodiscitis. Eur J Nucl Med Mol Imaging. 2015;42(2):264-271. Moritani T, Kim J, Capizzano AA, et al. Pyogenic and non-pyogenic spinal infections: emphasis on diffusion-weighted imaging for the detection of abscesses and pus collections. Br J Radiol. 2014;87(1041):20140011. Floris R, Spallone A, Aref TY, et al. 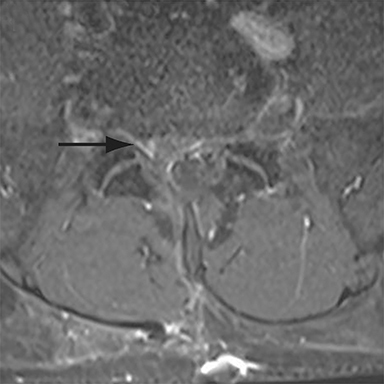 Early postoperative MRI findings following surgery for herniated lumbar disc. Part II: a gadolinium-enhanced study. Acta Neurochir. 1997;139(12): 1101–1107. Hueftle MG, Modic MT, Ross JS, et al. 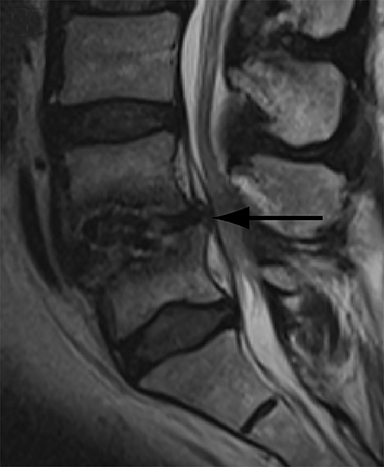 Lumbar spine: postoperative MR imaging with Gd-DTPA. Radiology. 1988;167(3):817-824. Coskun E, Süzer T, Topuz O, et al. Relationships between epidural fibrosis, pain, disability, and psychological factors after lumbar disc surgery. Eur Spine J. 2000;9(3):218–223. Ross JS, Robertson JT, Frederickson RC, et al. Association between peridural scar and recurrent radicular pain after lumbar discectomy: magnetic resonance evaluation. ADCON-L European Study Group. Neurosurgery. 1996;38(4):855–861. Bosscher HA, Heavner JE. Incidence and severity of epidural fibrosis after back surgery: an endoscopic study. Pain Pract. 2010;10(1):18–24. Stechishin ODM, Vertinsky AT, Street J, Shewchuk JR. A problem-solving approach to common challenges interpreting postoperative spinal imaging. Appl Radiol. 2018;47(6):7-13. Dr. Stechishin is a radiology resident and Dr. Vertinsky and Dr. Shewchuk are neuroradiologists with Vancouver General Hospital and the University of British Columbia, Vancouver, British Columbia, Canada; and Dr. Street is a spinal surgeon with the Vancouver Spine Surgery Institute and the University of British Columbia, Vancouver, British Columbia, Canada. The authors have no conflicts of interest to declare.